Gogol's The Nose exemplifies the genre of magical realism, often studied in U.S. grades 9-10. "How was it possible that the nose, which only yesterday he had on his face, and which could neither walk nor drive, should wear a uniform." The story was published in 1836, translated by Claud Field. On the 25th March, 18—, a very strange occurrence took place in St Petersburg. On the Ascension Avenue there lived a barber of the name of Ivan Jakovlevitch. He had lost his family name, and on his sign-board, on which was depicted the head of a gentleman with one cheek soaped, the only inscription to be read was, "Blood-letting done here." On this particular morning he awoke pretty early. Becoming aware of the smell of freshbaked bread, he sat up a little in bed, and saw his wife, who had a special partiality for coffee, in the act of taking some fresh-baked bread out of the oven. "Today, Prasskovna Ossipovna," he said, "I do not want any coffee ; I should like a fresh loaf with onions." "The blockhead may eat bread only as far as I am concerned," said his wife to herself; "then I shall have a chance of getting some coffee." And she threw a loaf on the table. "Quite firmly fixed !' " he murmured in his beard. " What can it be?" He put in his finger, and drew out—a nose ! Ivan Jakovlevitch at first let his hands fall from sheer astonishment; then he rubbed his eyes and began to feel it. A nose, an actual nose; and, moreover, it seemed to be the nose of an acquaintance ! Alarm and terror were depicted in Ivan's face; but these feelings were slight in comparison with the disgust which took possession of his wife. "Whose nose have you cut off, you monster ?" she screamed, her face red with anger. " You scoundrel ! You tippler ! I myself will report you to the police! Such a rascal! Many customers have told me that while you were shaving them, you held them so tight by the nose that they could hardly sit still." "But Ivan Jakovlevitch was more dead than alive ; he saw at once that this nose could belong to no other than to Kovaloff, a member of the Municipal Committee whom he shaved every Sunday and Wednesday. "Stop, Prasskovna Ossipovna ! I will wrap it in a piece of cloth and place it in the corner. There it may remain for the present; later on I will take it away." "No, not there! Shall I endure an amputated nose in my room? You understand nothing except how to strop a razor. You know nothing of the duties and obligations of a respectable man. You vagabond ! You good-for-nothing ! Am I to undertake all responsibility for you at the police-office? Ah, you soapsmearer ! You blockhead ! Take it away where you like, but don't let it stay under my eyes! "Ivan Jakovlevitch stood there flabbergasted. He thought and thought, and knew not what he thought. "The devil knows how that happened ! " he said at last, scratching his head behind his ear. " Whether I came home drunk last night or not, I really don't know; but in all probability this is a quite extraordinary occurrence, for a loaf is something baked and a nose is something different. I don't understand the matter at all." And Ivan Jakovlevitch was silent. The thought that the police might find him in unlawful possession of a nose and arrest him, robbed him of all presence of mind. Already he began to have visions of a red collar with silver braid and of a sword—and he trembled all over. He intended to lose it somewhere—either at somebody's door, or in a public square, or in a narrow alley; but just then, in order to complete his bad luck, he was met by an acquaintance, who showered inquiries upon him. "Hullo, Ivan Jakovlevitch ! Whom are you going to shave so early in the morning ?" etc., so that he could find no suitable opportunity to do what he wanted. Later on he did let the nose drop, but a sentry bore down upon him with his halberd, and said, "Look out ! You have let something drop !" and Ivan Jakovlevitch was obliged to pick it up and put it in his pocket. Ivan Jakovlevitch was a great cynic, and when Kovaloff, the member of the Municipal Committee, said to him, as was his custom while being shaved, "Your hands always smell, Ivan Jakovlevitch" the latter answered, "What do they smell of?" "I don't know, my friend, but they smell very strong." Ivan Jakovlevitch after taking a pinch of snuff would then, by way of reprisals, set to work to soap him on the cheek, the upper lip, behind the ears, on the chin, and everywhere. This worthy man now stood on the Isaac Bridge. At first he looked round him, then he leant on the railings of the bridge, as though he wished to look down and see how many fish were swimming past, and secretly threw the nose, wrapped in a little piece of cloth, into the water. He felt as though a ton weight had been lifted off him, and laughed cheerfully. Instead, however, of going to shave any officials, he turned his steps to a building, the sign-board of which bore the legend "Teas served here," in order to have a glass of punch, when suddenly he perceived at the other end of the bridge a police inspector of imposing exterior, with long whiskers, three-cornered hat, and sword hanging at his side. He nearly fainted; but the police inspector beckoned to him with his hand and said, "Come here, my dear sir." Ivan Jakovlevitch, knowing how a gentleman should behave, took his hat off quickly, went towards the police inspector and said, "I hope you are in the best of health." "Never mind my health. Tell me, my friend, why you were standing on the bridge." "By heaven, gracious sir, I was on the way to my customers, and only looked down to see if the river was flowing quickly." "That is a lie ! You won't get out of it like that. Confess the truth." "I am willing to shave Your Grace two or even three times a week gratis," answered Ivan Jakovlevitch. "No, my friend, don't put yourself out! Three barbers are busy with me already, and reckon it a high honour that I let them show me their skill. Now then, out with it ! What were you doing there ?" Kovaloff, the member of the Municipal Committee, awoke fairly early that morning, and made a droning noise—" Brr ! Brr ! "—through his lips, as he always did, though he could not say why. He stretched himself, and told his valet to give him a little mirror which was on the table. He wished to look at the heat-boil which had appeared on his nose the previous evening; but to his great astonishment, he saw that instead of his nose he had a perfectly smooth vacancy in his face. Thoroughly alarmed, he ordered some water to be brought, and rubbed his eyes with a towel. Sure enough, he had no longer a nose! Then he sprang out of bed, and shook himself violently ! No, no nose any more ! He dressed himself and went at once to the police superintendent. But before proceeding further, we must certainly give the reader some information about Kovaloff, so that he may know what sort of a man this member of the Municipal Committee really was. These committee-men, who obtain that title by means of certificates of learning, must not be compared with the committee-men appointed for the Caucasus district, who are of quite a different kind. The learned committee man—but Russia is such a wonderful country that when one committee-man is spoken of all the others from Eiga to Kamschatka refer it to themselves. The same is also true of all other titled officials. Kovaloff had been a Caucasian committee-man two years previously, and could not forget that he had occupied that position; but in order to enhance his own importance, he never called himself "committee-man" but "Major." "Listen, my dear," he used to say when he met an old woman in the street who sold shirtfronts; "go to my house in Sadovaia Street and ask 'Does Major Kovaloff live here?' Any child can tell you where it is." To increase his misfortune, not a single droshky was to be seen in the street, and so he was obliged to proceed on foot. He wrapped himself up in his cloak, and held his handkerchief to his face as though his nose bled. "But perhaps it is all only my imagination ; it is impossible that a nose should drop off in such a silly way," he thought, and stepped into a confectioner's shop in order to look into the mirror. Fortunately no customer was in the shop; only small shop-boys were cleaning it out, and putting chairs and tables straight. Others with sleepy faces were carrying fresh cakes on trays, and yesterday's newspapers stained with coffee were still lying about. "Thank God no one is here!" he said to himself. "Now I can look at myself leisurely." " What an infernal face !" he exclaimed, and spat with disgust. "If there were only something there instead of the nose, but there is absolutely nothing." He bit his lips with vexation, left the confectioner's, and resolved, quite contrary to his habit, neither to look nor smile at anyone on the street. Suddenly he halted as if rooted to the spot before a door, where something extraordinary happened. A carriage drew up at the entrance ; the carriage door was opened, and a gentleman in uniform came out and hurried up the steps. How great was Kovaloff's terror and astonishment when he saw that it was his own nose ! At this extraordinary sight, everything seemed to turn round with him. He felt as though he could hardly keep upright on his legs; but, though trembling all over as though with fever, he resolved to wait till the nose should return to the carriage. After about two minutes the nose actually came out again. It wore a gold-embroidered uniform with a stiff, high collar, trousers of chamois leather, and a sword hung at its side. The hat, adorned with a plume, showed that it held the rank of a state-councillor. It was obvious that it was paying "duty-calls." It looked round on both sides, called to the coachman "Drive on," and got into the carriage, which drove away. "How can I get at it?" thought Kovaloff. "Everything—the uniform, the hat, and so on —show that it is a state-councillor. How the deuce has that happened?" He began to cough discreetly near it, but the nose paid him not the least attention. "Honourable sir," said Kovaloff at last, plucking up courage, "honourable sir." " What do you want?" asked the nose, and turned round. "It seems to me strange, most respected sir-—you should know where you belong—and I find you all of a sudden—where? Judge yourself." "Pardon me, I do not understand what you are talking about. Explain yourself more distinctly." How shall I make my meaning plainer to him?" Then plucking up fresh courage, he continued, "Naturally—besides I am a Major. You must admit it is not befitting that I should go about without a nose. An old apple-woman on the Ascension Bridge may carry on her business without one, but since I am on the look out for a post; besides in many houses I am acquainted with ladies of high position—Madame Tchektyriev, wife of a state-councillor, and many others. So you see—I do not know, honourable sir, what you—(here the Major shrugged his shoulders). "Pardon me; if one regards the matter from the point of view of duty and honour—you will yourself understand—"
"I understand nothing," answered the nose. "I repeat, please explain yourself more distinctly." "Honourable sir," said Kovaloff with dignity, "I do not know how I am to understand your words. It seems to me the matter is as clear as possible. Or do you wish—but you are after all my own nose ! The nose looked at the Major and wrinkled its forehead. "There you are wrong, respected sir; I am myself. Besides, there can be no close relations between us. To judge by the buttons of your uniform, you must be in quite a different department to mine." So saying, the nose turned away. The day was fine and sunny. An immense crowd was passing to and fro in the Neffsky Avenue; a variegated stream of ladies flowed along the pavement. There was his acquaintance, the Privy Councillor, whom he was accustomed to style "General," especially when strangers were present. There was Iarygin, his intimate friend who always lost in the evenings at whist; and there another Major, who had obtained the rank of committee-man in the Caucasus, beckoned to him. "Go to the deuce !" said Kovaloff sotto voce. ' ' Hi ! coachman, drive me straight to the superintendent of police." So saying, he got into a droshky and continued to shout all the time to the coachman "Drive hard! " "Is the police superintendent at home?" he asked on entering the front hall. "No, sir," answered the porter," he has just gone out." "Ah, just as I thought!" "Yes," continued the porter, "he has only just gone out; if you had been a moment earlier you would perhaps have caught him." Kovaloff, still holding his handkerchief to his face, re-entered the droshky and cried in a despairing voice "Drive on ! "But how? There are cross-roads here. Shall I go to the right or the left?" But just as he was about to order the coachman to drive to the police-station, the idea occurred to him that this rascally scoundrel who, at their first meeting, had behaved so disloyally towards him, might, profiting by the delay, quit the city secretly ; and then all his searching would be in vain, or might last over a whole month. Finally, as though visited with a heavenly inspiration, he resolved to go directly to an advertisement office, and to advertise the loss of his nose, giving all its distinctive characteristics in detail, so that anyone who found it might bring it at once to him, or at any rate inform him where it lived. Having decided on this course, he ordered the coachman to drive to the advertisement office, and all the way he continued to punch him in the back—"Quick, scoundrel ! quick !" "Yes, sir !" answered the coachman, lashing his shaggy horse with the reins. "Who takes in the advertisements here?" exclaimed Kovaloff. "At your service, sir," answered the grey haired functionary, looking up and then fastening his eyes again on the heap of coins before him. "I wish to place an advertisement in your paper—"
"Have the kindness to wait a minute," answered the official, putting down figures on paper with one hand, and with the other moving two balls on his calculating-frame. A lackey, whose silver-laced coat showed that he served in one of the houses of the nobility, was standing by the table with a note in his hand, and speaking in a lively tone, by way of showing himself sociable. " Would you believe it, sir, this little dog is really not worth twenty-four kopecks, and for my own part I would not give a farthing for it; but the countess is quite gone upon it, and offers a hundred roubles' reward to anyone who finds it. To tell you the truth, the tastes of these people are very different from ours; they don't mind giving five hundred or a thousand roubles for a poodle or a pointer, provided it be a good one." "Sir, allow me to ask you—I am in a great hurry," he said at last impatiently. "In a moment ! In a moment ! Two roubles, twenty-four kopecks—one minute ! One rouble, sixty-four kopecks !" said the grey-haired official, throwing their notes back to the housekeepers and porters. " What do you wish?" he said, turning to Kovaloff. "I wish—" answered the latter, "I have just been swindled and cheated, and I cannot get hold of the perpetrator. I only want you to insert an advertisement to say that whoever brings this scoundrel to me will be well rewarded." " What is your name, please? "Why do you want my name? I have many lady friends—Madame Tchektyriev, wife of a state-councillor, Madame Podtotchina, wife of a Colonel. Heaven forbid that they should get to hear of it. You can simply write 'committeeman' or, better, 'Major.'" "And the man who has run away is your serf." "Serf! If he was, it would not be such a great swindle ! It is the nose which has absconded." "H'm! What a strange name. And this Mr Nose has stolen from you a considerable sum?" "Mr Nose! Ah, you don't understand me! It is my own nose which has gone, I don't know where. The devil has played a trick on me." "How has it disappeared? I don't understand." "I can't tell you how, but the important point is that now it walks about the city itself a state councillor. That is why I want you to advertise that whoever gets hold of it should bring it as soon as possible to me. Consider; how can I live without such a prominent part of my body? It is not as if it were merely a little toe ; I would only have to put my foot in my boot and no one would notice its absence. Every Thursday I call on the wife of M. Tchektyriev, the state councillor; Madame Podtotchina, a Colonel's wife who has a very pretty daughter, is one of my acquaintances; and what am I to do now? I cannot appear before them like this." The official compressed his lips and reflected. "No, I cannot insert an advertisement like that," he said after a long pause. "Because it might compromise the paper. Suppose everyone could advertise that his nose was lost. People already say that all sorts of nonsense and lies are inserted." "But this is not nonsense ! There is nothing of that sort in my case." "You think so? Listen a minute. Last week there was a case very like it. An official came, just as you have done, bringing an advertisement for the insertion of which he paid two roubles, sixty-three kopecks; and this advertisement simply announced the loss of a black-haired poodle. There did not seem to be anything out of the way in it, but it was really a satire ; by the poodle was meant the cashier of some establishment or other." "But I am not talking of a poodle, but my own nose; i.e. almost myself." "No, I cannot insert your advertisement." "But my nose really has disappeared !" "That is a matter for a doctor. There are said to be people who can provide you with any kind of nose you like. But I see that you are a witty man, and like to have your little joke." "But I swear to you on my word of honour. Look at my face yourself." "Why put yourself out?" continued the official, taking a pinch of snuff." All the same, if you don't mind," he added with a touch of curiosity, "I should like to have a look at it." "It certainly does look odd," said the official. "It is perfectly flat like a freshly fried pancake. It is hardly credible." "Very well. Are you going to hesitate any more? You see it is impossible to refuse to advertise my loss. I shall be particularly obliged to you, and I shall be glad that this incident has procured me the pleasure of making your acquaintance." The Major, we see, did not even shrink from a slight humiliation. "It certainly is not difficult to advertise it," replied the official;" but I don't see what good it would do you. However, if you lay so much stress on it, you should apply to someone who has a skilful pen, so that he may describe it as a curious, natural freak, and publish the article in the Northern Bee" (here he took another pinch) "for the benefit of youthful readers (he wiped his nose), "or simply as a matter worthy of arousing public curiosity." The official himself seemed touched at his difficult position. Desiring to console him, he tried to express his sympathy by a few polite words. "I much regret," he said, "your extraordinary mishap. Will you not try a pinch of snuff? It clears the head, banishes depression, and is a good preventive against haemorroids." This act, quite innocent in itself, exasperated Kovaloff. "I don't understand what you find to joke about in the matter," he exclaimed angrily. "Don't you see that I lack precisely the essential feature for taking snuff? The devil take your snuff-box. I don't want to look at snuff now, not even the best, certainly not your vile stuff!" So saying, he left the advertisement office in a state of profound irritation, and went to the commissary of police. He arrived just as this dignitary was reclining on his couch, and saying to himself with a sigh of satisfaction, "Yes, I shall make a nice little sum out of that." It might be expected, therefore, that the committee-man's visit would be quite inopportune. This police commissary was a great patron of all the arts and industries; but what he liked above everything else was a cheque. "It is a thing," he used to say, "to which it is not easy to find an equivalent ; it requires no food, it does not take up much room, it stays in one's pocket, and if it falls, it is not broken." The commissary's reception of him hurt his feelings so much that he raised his head proudly, and said with dignity, "After such insulting expressions on your part, I have nothing more to say." And he left the place. He reached his house quite wearied out. It was already growing dark. After all his fruitless search, his room seemed to him melancholy and even ugly. In the vestibule he saw his valet Ivan stretched on the leather couch and amusing himself by spitting at the ceiling, which he did very cleverly, hitting every time the same spot. His servant's equanimity enraged him; he struck him on the forehead with his hat, and said, "You good-for-nothing, you are always playing the fool!" Once in his room, the Major, tired and depressed, threw himself in an armchair and, after sighing a while, began to soliloquise : "In heaven's name, why should such a misfortune befall me? If I had lost an arm or a leg, it would be less insupportable; but a man without a nose ! Devil take it !—what is he good for? He is only fit to be thrown out of the window. If it had been taken from me in war or in a duel, or if I had lost it by my own fault! But it has disappeared inexplicably. But no ! it is impossible," he continued after reflecting a few moments, "it is incredible that a nose can disappear like that—quite incredible. I must be dreaming, or suffering from some hallucination ; perhaps I swallowed, by mistake instead of water, the brandy with which I rub my chin after being shaved. That fool of an Ivan must have forgotten to take it away, and I must have swallowed it." In order to find out whether he were really drunk, the Major pinched himself so hard that he unvoluntarily uttered a cry. The pain convinced him that he was quite wide awake. He walked slowly to the looking-glass and at first closed his eyes, hoping to see his nose suddenly in its proper place; but on opening them, he started back. "What a hideous sight!" he exclaimed. It was really incomprehensible. One might easily lose a button, a silver spoon, a watch, or something similar; but a loss like this, and in one's own dwelling ! "Does Major Kovaloff live here?" it asked. "Come in!" said the Major, rising rapidly and opening the door. He saw a police official of pleasant appearance, with grey whiskers and fairly full cheeks—the same who at the commencement of this story was standing at the end of the Isaac Bridge. "Have you lost your nose?" he asked. "It has just been found." "What are you saying?" stammered Major Kovaloff. "How was it?" he asked at last. "By a very singular chance. It has been arrested just as it was getting into a carriage for Eiga. Its passport had been made out some time ago in the name of an official ; and what is still more strange, I myself took it at first for a gentleman. Fortunately I had my glasses with me, and then I saw at once that it was a nose. I am shortsighted, you know, and as you stand before me I cannot distinguish your nose, your beard, or anything else. My mother-in-law can hardly see at all." Kovaloff was beside himself with excitement. "Where is it? Where? I will hasten there at once." "Don't put yourself out. Knowing that you need it, I have brought it with me. Another singular thing is that the principal culprit in the matter is a scoundrel of a barber living in the Ascension Avenue, who is now safely locked up. I had long suspected him of drunkenness and theft; only the day before yesterday he stole some buttons in a shop. Your nose is quite uninjured." So saying, the police commissary put his hand in his pocket and brought out the nose wrapped up in paper. "Yes, yes, that is it!" exclaimed Kovaloff. "Will you not stay and drink a cup of tea with me?" "I should like to very much, but I cannot. I must go at once to the House of Correction. The cost of living is very high nowadays. My mother-in-law lives with me, and there are several children; the eldest is very hopeful and intelligent, but I have no means for their education." "Yes, this is it !" he said to himself. "Here is the heat-boil on the left side, which came out yesterday." And he nearly laughed aloud with delight. "Hold on, you stupid!" he said. But the nose seemed to be made of wood, and fell back on the table with a strange noise, as though it had been a cork. The Major's face began to twitch feverishly. "Is it possible that it won't stick?" he asked himself, full of alarm. But however often he tried, all his efforts were in vain. The doctor came immediately. After having asked the Major when this misfortune had happened, he raised his chin and gave him a fillip with his finger just where the nose had been, in such a way that the Major suddenly threw back his head and struck the wall with it. The doctor said that did not matter; then, making him turn his face to the right, he felt the vacant place and said " H'm! " then he made him turn it to the left and did the same ; finally he again gave him a fillip with his finger, so that the Major started like a horse whose teeth are being examined. After this experiment, the doctor shook his head and said, "No, it cannot be done. Either remain as you are, lest something worse happen. Certainly one could replace it at once, but I assure you the remedy would be worse than the disease." "All very fine, but how am I to go on without a nose?" answered Kovaloff. "There is nothing worse than that. How can I show myself with such a villainous appearance ? I go into good society, and this evening I am invited to two parties. I know several ladies, Madame Tchektyriev, the wife of a state-councillor, Madame Podtotchina—although after what she has done, I don't want to have anything to do with her except through the agency of the police. I beg you," continued Kovaloff in a supplicating tone, "find some way or other of replacing it; even if it is not quite firm, as long as it holds at all; I can keep it in place sometimes with my hand, whenever there is any risk. Besides, I do not even dance, so that it is not likely to be injured by any sudden movement. As to your fee, be in no anxiety about that; I can well afford it." "Believe me," answered the doctor in a voice which was neither too high nor too low, but soft and almost magnetic, "I do not treat patients from love of gain. That would be contrary to my principles and to my art. It is true that I accept fees, but that is only not to hurt my patients' feelings by refusing them. I could certainly replace your nose, but I assure you on my word of honour, it would only make matters worse. Bather let Nature do her own work. Wash the place often with cold water, and I assure you that even without a nose, you will be just as well as if you had one. As to the nose itself, I advise you to have it preserved in a bottle of spirits, or, still better, of warm vinegar mixed with two spoonfuls of brandy, and then you can sell it at a good price. I would be willing to take it myself, provided you do not ask too much." "No, no, I shall not sell it at any price. I would rather it were lost again." "Excuse me," said the doctor, taking his leave. "I hoped to be useful to you, but I can do nothing more ; you are at any rate convinced of my good-will." So saying, the doctor left the room with a dignified air. "No," said Kovaloff, after having reperused the letter, "she is certainly not guilty. It is impossible. Such a letter could not be written by a criminal." The committee-man was experienced in such matters, for he had been often officially deputed to conduct criminal investigations while in the Caucasus. "But then how and by what trick of fate has the thing happened?" he said to himself with a gesture of discouragement. "The devil must be at the bottom of it." Meanwhile the rumour of this extraordinary event had spread all over the city, and, as is generally the case, not without numerous additions. At that period there was a general disposition to believe in the miraculous; the public had recently been impressed by experiments in magnetism. The story of the floating chairs in Koniouchennaia Street was still quite recent, and there was nothing astonishing in hearing soon afterwards that Major Kovaloffs nose was to be seen walking every day at three o'clock on the Neffsky Avenue. The crowd of curious spectators which gathered there daily was enormous. On one occasion someone spread a report that the nose was in Junker's stores and immediately the place was besieged by such a crowd that the police had to interfere and establish order. 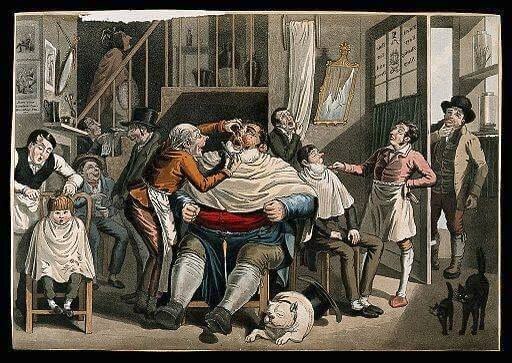 A certain speculator with a grave, whiskered face, who sold cakes at a theatre door, had some strong wooden benches made which he placed before the window of the stores, and obligingly invited the public to stand on them and look in, at the modest charge of twenty-four kopecks. A veteran colonel, leaving his house earlier than usual expressly for the purpose, had the greatest difficulty in elbowing his way through the crowd, but to his great indignation he saw nothing in the store window but an ordinary flannel waistcoat and a coloured lithograph representing a young girl darning a stocking, while an elegant youth in a waistcoat with large lappels watched her from behind a tree. The picture had hung in the same place for more than ten years. The colonel went off, growling savagely to himself, :How can the fools let themselves be excited by such idiotic stories?" "Oh!" exclaimed Kovaloff. For sheer joy he was on the point of performing a dance barefooted across his room, but the entrance of Ivan prevented him. He told him to bring water, and after washing himself, he looked again in the glass. The nose was there ! Then he dried his face with a towel and looked again. Yes, there was no mistake about it ! "Look here, Ivan, it seems to me that I have a heat-boil on my nose," he said to his valet. And he thought to himself at the same time, "That will be a nice business if Ivan says to me 'No, sir, not only is there no boil, but your nose itself is not there !'" But Ivan answered, "There is nothing, sir ; I can see no boil on your nose." "Good! Good!" exclaimed the Major, and snapped his fingers with delight. "Tell me first, are your hands clean?" asked Kovaloff when he saw him. "I swear they are perfectly clean, sir." "Very well; then come here." "There it is !" said the barber to himself, as he glanced at the nose. Then he bent his head a little and examined it from one side. "Yes, it actually is the nose—really, when one thinks—" he continued, pursuing his mental soliloquy and still looking at it. Then quite gently, with infinite precaution, he raised two fingers in the air in order to take hold of it by the extremity, as he was accustomed to do.
" Now then, take care!" Kovaloff exclaimed. When the barber had finished, Kovaloff hastened to dress himself, took a droshky, and drove straight to the confectioner's. As he entered it, he ordered a cup of chocolate. He then stepped straight to the mirror ; the nose was there ! He returned joyfully, and regarded with a satirical expression two officers who were in the shop, one of whom possessed a nose not much larger than a waistcoat button. After that he went to the office of the department where he had applied for the post of vice-governor of a province or Government bailiff. As he passed through the hall of reception, he cast a glance at the mirror ; the nose was there ! Then he went to pay a visit to another committeeman, a very sarcastic personage, to whom he was a"ccustomed to say in answer to his raillery, Yes, I know, you are the funniest fellow in St Petersburg." On the way he said to himself, "If the Major does not burst into laughter at the sight of me, that is a most certain sign that everything is in its accustomed place." "Very good !" thought Kovaloff. As he returned, he met Madame Podtotchina with her daughter. He accosted them, and they responded very graciously. The conversation lasted a long time, during which he took more than one pinch of snuff, saying to himself, "No, you haven't caught me yet, coquettes that you are ! And as to the daughter, I shan't marry her at all." Another difficulty is—how was the nose found in the baked loaf, and how did Ivan Jakovlevitch himself—no, I don't understand it at all ! You may also enjoy Mark Twain's satirical story, About Barbers. Add The Nose to your own personal library.